Acta Aquatica: Aquatic Sciences Journal is a scientific open access journal in the field of aquatic sciences, published periodically (April and October) by the Institute of Research and Community Service (LPPM) Universitas Malikussaleh (Malikussaleh University) in cooperation with Marine Center Universitas Malikussaleh, Department of Aquaculture Universitas Malikussaleh and Department of Marine Science Universitas Malikussaleh. 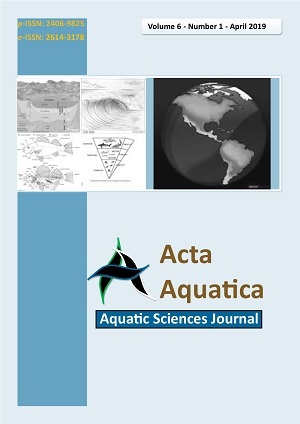 Acta aquatica are publish original research, overviews and reviews relating to aquatic environments (wetlands, freshwater and marine waters) and the border limits of these environmental systems and the impacts of human activities on the environmental systems. Acta Aquatica has a related studies in aquatic bioecology, aquaculture, hydrology, biodiversity of aquatic biosphere, oceanology, exploitation and exploration technology of aquatic resources, fisheries product technology, aquatic microbiology, aquatic modeling, aquatic geographic information systems, and socio-economic of aquatic resources.